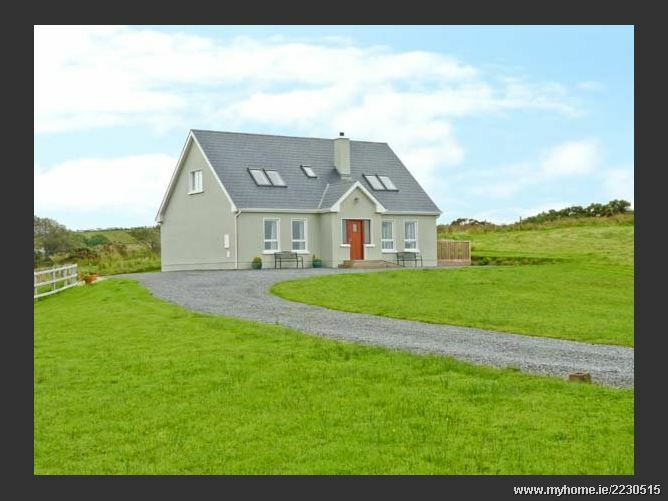 Crona Cottage is a detached, high quality cottage, situated near Mountcharles in northwest Ireland and can sleep eight people. The cottage has a double bedroom, a twin bedroom, a ground floor twin bedroom, a ground floor double bedroom, a shower room, a ground floor bathroom and an open plan living area with fitted kitchen, dining area and sitting area with a multi-fuel stove. Outside there is off road parking for six cars, a front lawned garden and a rear lawned garden with decking, furniture and a barbecue. With lovely ocean views, and a sandy beach nearby, Crona Cottage is perfect for a family holiday to Ireland. The village of Mountcharles sits overlooking Donegal Bay in an Area of Outstanding Natural Beauty, with views of the majestic Bluestack Mountains. Just six miles away is the town of Donegal, with its historic castle, and if you fancy a day on the beach, Rossnowlagh (otherwise known as the "Heavenly Cove) is recognised as the most beautiful beach in this part of Ireland. The West of Ireland conjures up many images; thatched, whitewashed cottages, a flock of sheep on a narrow road, an emerald greenfield with a stone wall, or the Atlantic waves crashing into towering cliffs and rocky shores. Oil central heating with multi-fuel stove. Electric oven and hob, microwave, fridge/freezer, washing machine, tumble dryer, dishwasher, TV with Freeview, DVD, CD, radio, selection of books, games and DVDs. Fuel, power and starter pack for multi-fuel stove inc. in rent. Bed linen and towels inc. in rent. Off road parking for 6 cars. Front lawned garden, rear lawned garden with decking, furniture and BBQ. One well-behaved dog welcome. Shop 3 miles, pub 1.5 miles..